and everything is beautiful, when you’re young and pretty. or at least, that’s what They Might Be Giants told me once, in a song. last week around this time, i was attending the Future Of Web Design workshops and conference. i got in my focus and i drove down to manhattan last sunday. yeah, probably crazy. who knew it was marathon day? well, i arrived as the race was ending, so that wasn’t a problem. just some very tired looking folks wandering around wrapped in space blankets. the conference was pretty good. i did learn a bit. there was a common thread that i don’t think they expected, but a lot of people were interested in workflow and process improvement. most of the speakers did pretty well; a few had some nerves but eventually loosened up. as far as networking, not much opportunity. workshop day was pretty busy, and i was tired and grumpy for some reason. i thought, conference day would have more people and mingling in between speakers. well – not really. between speakers they blasted music so loud that you couldn’t hear yourself think, much less strike up a conversation. if you walked out from the main venue area, it was almost completely dark. so, i enjoyed being in new york, i got probably as much value out of the conference as i paid in, and after a couple days i was completely exhausted and ready to get home. a panoramic photo i shot during our trip to maine last month. this past Sunday, we decided to partake in some recreation, New England style. we drove up to Mt. Washington, in the Presidential Range of the White Mountains. the day started with bagels and a nice drive through Goffstown and Dunbarton. when we reached I-93, we were nearly run off the road several times by careless drivers from New Jersey. 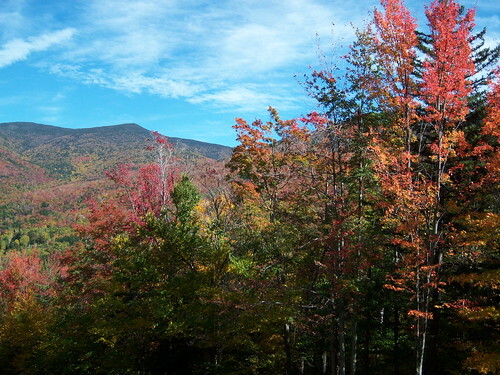 welcome to leaf-peeping season in New England! we’re here. the last 400-ish miles were ones that we’ve trod before. this time, was uneventful. we took our new preferred, summer-only route through vermont, and stopped, as always, at McNeil’s Brewery in Brattleboro (no website – doesn’t open until 4!). i’ll work on a synopsis of the whole trip, but first we’ve got some household-establishing duties that require more attention.